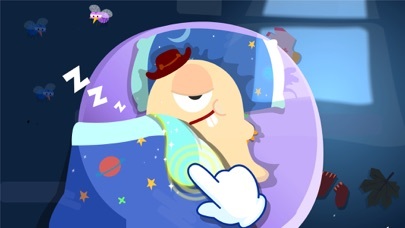 Good Habits & Manners is the funniest and simplest game for kids to cultivate good habits. The app helps kids cultivate 4 important habits, that is, hygiene, healthy diet, cleanup and politeness. It has cute and meaningful medals to encourage kids as rewards. The content of the app includes Hygiene Habit(Baby Panda's Toothbrush,Baby Panda's Bath Time,Toilet Training), Healthy Diet, Housework cleanup, courtesy and politeness. Keeping good habits do make you happy and will help you become a little adult. Come and try "Kids' Good Habits & Manners", you will find joy in it! Here, you can kill bad bacteria hiding in teeth to prevent them from destroying our teeth. Besides, you can make friends and do some cleaning, brush teeth and have a bubble bath with panda Kiki.Wow~It's time to eat now! Vegetables and meat keep your body strong. Bravo! It's awesome to eat on your own. Oh no, panda Kiki' s home is dirty now. Let's do the housework Cleanup with Kiki. Come on,Messy house Makeover! Say "Thank you!" when someone gives a hand to you. Say "Sorry!" when you do something wrong. Sharing fun toys and yummy cakes&snacks with friends makes you happy.Kids who using magical polite words will have magical powers to help animals! You can never imagine how fun you will have here! Just have a try! 1.Various cute toothbrush and toothpaste for you to choose. 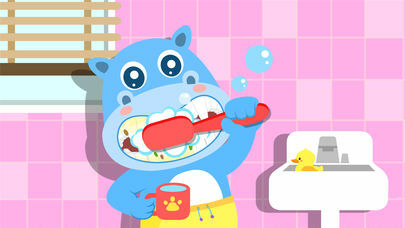 Brush your teeth and keep them clean! 2. What a funny bubble bath! Help Kiki and Momo adjust the water temperature first, and then sponge the stains on their bodies. 3. Don't play with toys when you go to the toilet. And never eat in the toilet!Don't forget to flush the toilet after using it and wash your hands! 4.Broccoli has vitamins and keep your body strong. Beef is good for health!Cereal makes you powerful! 5.This room is a mess. We have some cleaning up to do. 6.Pick up the peel and paper throwing into the trash can, clean the floor with a vacuum cleaner, and put the books in order! The small room becomes neat and tidy. You really did a great job! 7.Say Hello when you greet someone! Say goodbye when parting! 8. Oh no, animals look sad. 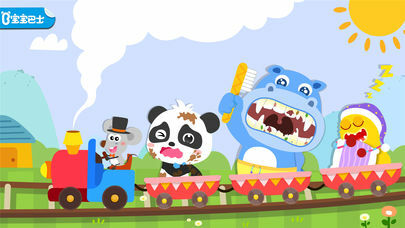 Let's wipe the tears of our little friends and play together with them, bringing smile back on their faces. 9. Welcome to our Sharing Party! Animals all bring yummy snacks and fun toys here to share! 10.Kiki's Birthday is coming soon. Let's prepare a special birthday party for Kiki! 2. It helps kids cultivate 4 important habits, that is, hygiene, healthy diet, cleanup and politeness. 3. Cute and meaningful medals are setting for kids as rewards. 4. Simple and interesting for toddlers.